Public speaking venues don't come much tougher than aircraft. Few crowds are tetchier than air passengers. So what can we learn from the people who have to communicate at 35,000 ft? I arrived late to the air travel party. Aged 18, I was a fretful first-timer. My friend, an experienced flyer by comparison, was relying on Valium to get her through. This made me extremely anxious. Legendary Dutch soccer player Dennis Bergkamp was so terrified of flying he travelled to overseas games by road, rail or sea. If the match was too far away, he just stayed home. It got so bad I would look up at the sky during away games to see what the weather was like. Were there any clouds coming? Sometimes I was preoccupied by the flight home while I was playing football. It was hell... I'm simply not flying again. Ever. Sean Bean is afraid of flying. That's Sean Bean, protector of Gondor. Warden of the North. King of Ithaca. I used to drive to all my film locations in Europe but I couldn't when it came to filming The Lord Of The Rings in New Zealand… I wouldn't get into a helicopter with the rest of the cast. They had to wait for me to walk up the mountain and join them before they could start filming. Some of the finest names in acting are similarly afflicted: Ben Affleck, Jennifer Aniston, Nick Jonas. Flying means physical and emotional pain for many of us – waking at ungodly hours, malfunctioning inner ears, frustration at not 'being there yet'. All the while, pilots and cabin crew need to give us information. But how do you get through to such a miserable, anxious crowd? With laughter. Nothing relaxes us like laughter. So what does it look like when people with our lives in their hands make us laugh? Need some more? Try these 21 funny airline announcements. 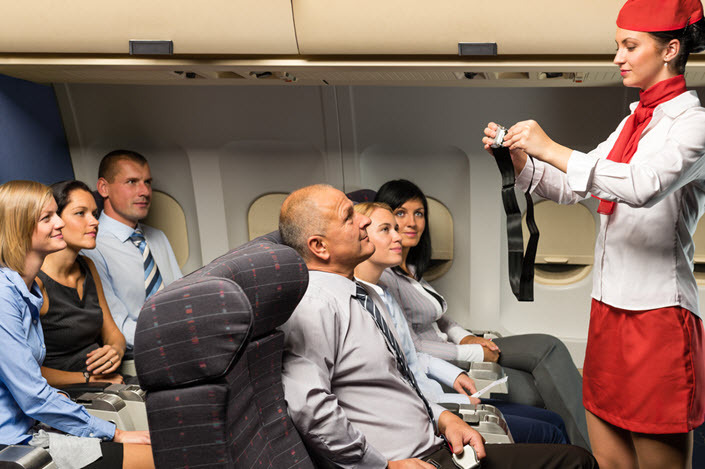 It's unlikely your audience will be as angst-ridden as a nervous flyer. But they may well lack confidence in their abilities. They might be nervous about joining in. They may just not want to be there. This happens all the time – in office meeting rooms, at training centres and in classrooms. A little light-heartedness can soften their hard edges. Don't take yourself or the experience too seriously, and maybe they'll do the same. The fastest way by far is to bang your head quite hard against a low beam. This instantly robs you of dignity, composure and intelligence, and makes virtually anybody else look as though they've got their life together. In general, it acts as a means of breaking the ice in groups, of uniting groups, of helping people relax and feel welcome. It helps relieve tension, and create hierarchies... You will find joking is strong in military units, or medical teams – any group that requires high levels of trust and teamwork. Maybe that's all they're doing at 35,000 ft. Perhaps our hilarious cabin crew are just building trust in each other. Either way, the laughter makes us feel part of their group too. We're all in this metal tube together, after all, hurtling through the atmosphere at 920 km/h. So try to have more fun with your crowd. Maybe they'll relax long enough to take in what you have to say.